Super Bowl may be the one time in American TV viewing throughout the year when the public looks forward to the advertisements. Super Bowl ads have fast become part of the Super Bowl Sunday experience as much as the game, the snacks, and the halftime show. In fact, in lieu of a wardrobe malfunction or a bad 2nd down call on the 1 yard line with 26 seconds left to play, the ads are often the most talked about part of the game, especially if you are a fan of any of the 30 NFL teams that were also at home watching the game. Super Bowl ads may be entertaining, but they are bad marketing examples, especially for small business owners. 1. No call to action. 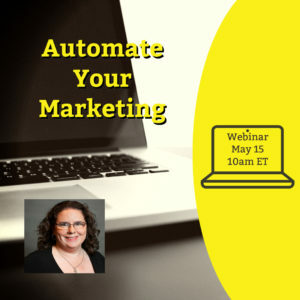 Marketing today especially is about eliciting a measurable response. With limited time and resources, small businesses cannot waste any of them on branding. 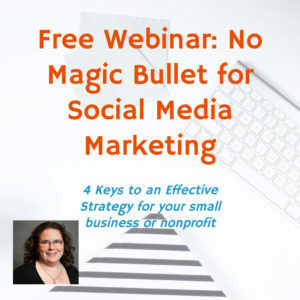 They need to have a call to action that gets prospects in their sales funnel. What is that first step in your sales cycle? What do you want your prospects to do once they find you? 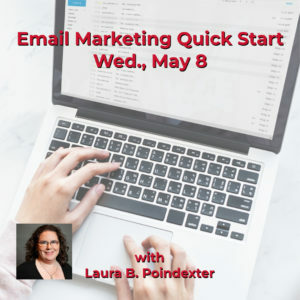 Is it subscribing to your email list? Filling out a form on your website? Calling for an appointment? This needs to be very clear in all your marketing. Unfortunately, most Super Bowl ads, do not have a call to action or more specifically a call to action that leads prospects down the path to purchase. This year, however, I like two ads that have a direct call to action: Groupon and Stella Artois. Tiffany Haddish gives a clear call to action: download the Groupon app. Matt Damon implores you to buy a limited-edition Stella Artois Chalice which provides water to someone impacted by the global water crisis for 5 years. 2. No value to the customer. Super Bowl ads are more about being cute and getting talked about than delivering value to the customer. As a small business, you cannot afford to be cute and not make it clear to your customers what you do. As a society, our attention spans are getting shorter and shorter; the most effective marketing is to be direct about whom you serve and how you can help them. A good example from this year’s Super Bowl ads is Percil with honorable mention going to Febreeze. There’s no question what Percil does. This is a good clear message. 3. No increase in sales. Often the most-loved ads do not improve the sales. Perhaps, the most-loved and favorite Super Bowl ad of all time featuring Mean Joe Greene was pulled after a few months by Coca-Cola because sales did not increase. Unfortunately, this beloved ad did not help Coke sales. Small businesses need to make sure there is a positive Return on Investment for every dollar spent marketing. Winning the ads on Super Bowl Sunday does not equate to winning sales. A smart small business owner should not be concerned with winning ad competitions, but rather sales competitions. So by all means, enjoy the ads and the memes that spring from them. You can view them all here. However, please do NOT model your marketing after Super Bowl ads. Model your marketing with a good solid strategy that focuses on eliciting a measurable response. Now that social media is a key factor in business marketing for businesses of all sizes, I wanted to give some honorable mentions to those ads which do a good job incorporating social media. There are the occasional social media handles and hashtags at the end of some of the ads but this early Super Bowl commercial took it a step further. The ad by Kraft is a great way to engage the audience during the Super Bowl however, they are asking viewers to go to a website and there is no indication in the ad of appropriate hashtags or Kraft social handles. Sometimes it is the little details that can greatly affect a campaign. 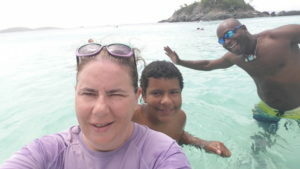 Kraft wants you to share your family game day pictures to be part of their Super Bowl commercial. All your marketing should include your social media information. However, before you start pushing people to your social media, be sure you are not making these 6 Social Media Mistakes. And finally, an honorable mention: part 2 of the Michelob Ultra Super Bowl commercial. Just for fun, because it’s Chris Pratt but mainly because it includes my favorite country song from my childhood. You can ask my siblings, they will attest…I Like Beer by Tom T Hall. Michelob Ultra “I like beer” commercial is part 2 of Super Bowl ad. 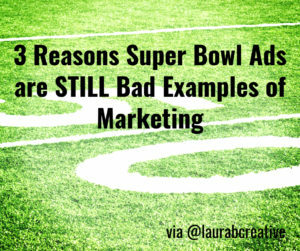 The original version of this post was published in 2015: 3 Reasons Super Bowl Ads are Bad Examples of Marketing. 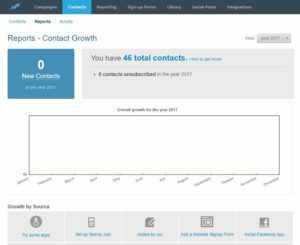 If you are a Constant Contact user, be sure to grab this quick report before year end. This is all great information and you should be tracking your list growth and unsubscribes on a regular basis. However, the year to date data will reset on January 1. So, follow these instructions to grab the data before the New Year. 5. Take a screenshot of the full window, including the “Growth by Source” information below the overall growth chart. I use Snagit by TechSmith but you can use any screenshot software or just use Print Screen on a Windows machine or Shift-Command-4 on a Mac. 6. Save your screenshot so you can access the data when you are ready to review it. 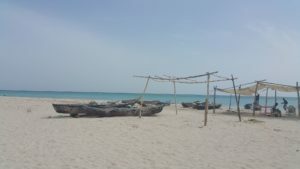 A few years ago, I wrote one of my most popular articles: Please Do NOT Boost That Facebook Post. I’ve since had a change of heart because Facebook has changed the options available for boosting posts. 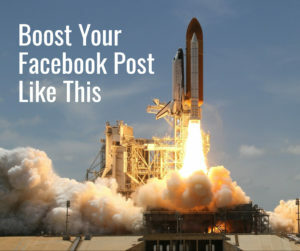 I still believe most businesses are not boosting Facebook posts properly and I hope to shed some light on a simple, but effective strategy to get value out of your boosts. My main argument against boosting was the targeting available at the time and that boosting a post unsuccessfully would lead to wasted money and be a detriment to your organic Facebook engagement. So if you are still boosting posts and choosing random targeting like age, location, and interests, I would recommend that you stop immediately and read this post before boosting again. As a business owner, you have such an incredible opportunity with Facebook to find your audience and to reach new prospects but sadly most business owners do not utilize these features and just blindly throw $20-50 behind a post and then get frustrated by the results. I believe in boosting your best content on Facebook. But it must be content that leads your customer into your sales funnel. The number one error I see in Facebook advertising is when businesses have no concept or plan for the customer journey. 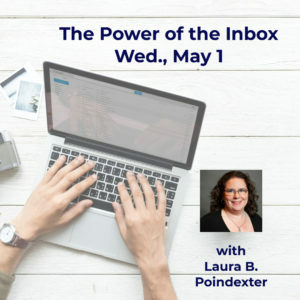 The post does not have to lead directly to a sale, but it does have to move your prospect closer to purchasing from you – it can be a photo, video, or link to content on your website. But you should not be sending paid traffic to anything that is not tested. That being said, when you do have some great content that performs well on Facebook and that is a key step in your customer journey, this is the post to boost (as described below). First, you must give the post a day or two to get some organic engagement before boosting. We want some positive comments, likes, and shares. No one will read the post if there is no engagement. Nothing draws a crowd like a crowd. How often you should follow this model really depends on how often you post to Facebook. My recommendation is to boost only 10-15% of your posts if that. Many social media “gurus” will tell you that you need to advertise to get reach on Facebook. I completely disagree. If you are boosting posts, be sure to post really great engaging content for your regular page posts as well. This is the key. Why would you post to a random group of people? You know who your audience is, right? The description of Custom Audiences and Lookalike Audiences in my original post holds true. The exciting change is once you create an Audience in Facebook Ads Manager, you can now boost to that audience. This is so much more powerful than boosting to random people who happen to live near your business. Wouldn’t you agree? 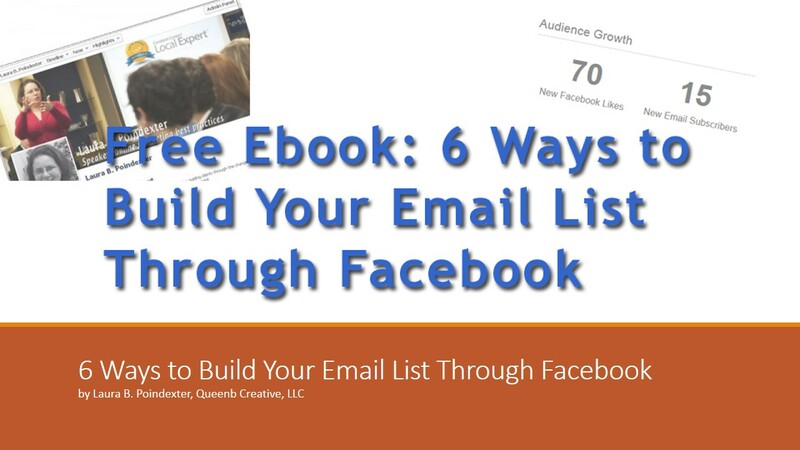 You have a list of your customers, prospects, or subscribers and now you can reach them and people like them. For more details read Please Do NOT Boost That Facebook Post. I hope you will create some Custom Audiences and Lookalike Audiences of your own now and use these in your strategic post boosts.